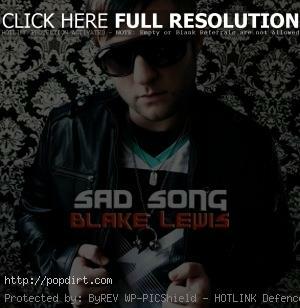 Blake Lewis is out with the music video to his new single ‘Sad Song’, from the ‘American Idol’ season six runner-up’s forthcoming second album ‘Heartbreak On Vinyl’, in stores October 6th on Tommy Boy Entertainment. The video was shot as a 1940s film-noir style story about the end of a couple’s relationship, highlighted with some 40s-meets-80s style fashion and video editing. The female lead is played by fellow ‘Idol’ alum Casey Carlson. Watch it via MySpace below. This is epic!!! Love the song, and the video. Now I just wish it would hit the radio! So everyone start requesting it!